NEWS - Seven year old who has had 341 hospital operations serenaded by Robbie Williams Tribute - Millennium! Robbie Williams' serenaded a seven-year-old girl who has had 341 operations for burns with a rendition of She's The One at a fundraising event in Strelley. Tilly Sawford's face lit up as East Leake Robbie impersonator Matt Holbrook sang the pop classic as part of a set that features 90s anthem Angels. Mum Emma Sawford had organised the day to raise money for the Enzo's Friends, a charity that supports people who have suffered serious burns. Tilly, and dozens of her friends at Djanogly Strelley Academy, rode ponies, heard Harley Davidson motorbikes rev, tooted police car sirens and had a visit from Enzo the dragon. "My favourite part was riding the pony," said Tilly. "It was a white one called Snowy. I'm in the hospital a lot so it's nice to have a day with my friends. I even put a policeman in handcuffs." The youngster, who is in a wheelchair, was 15months old when she slipped into a scalding bathtub, suffering 86 per cent burns. She has so far had 341 operations, and is set to have her leg amputated in a bid to help her walk again. And brave Tilly is the only child in the Midlands to have survived such large burns. Mum Emma Sawford, of Moor Road, said: "It's just been lovely to watch her enjoy herself. She spends so much time in the hospital that she deserves a day like this. "Robbie Williams was amazing. Everyone had a great sing-along and Tilly lit up when he sang to her." Matt Holbrook, 40, has toured the world for 18-years in his tribute act, and heard Tilly's story through friends at the Crown Hotel pub at Crown Island, where he performs. "I was choking up when I was singing to her," he said. "It's such an inspiration to see her adapting to the situations despite her injuries, and she's so full of smiles. "As soon as I heard her story I jumped at the chance to help." Tilly's great uncle, Terry Hill, is a member of the Sherwood Chapter of the Robin Hood Harley Davidson Motorbike Club. And although he couldn't be at the Helston Drive school on Saturday, 14 menacing machines rolled in, catching visitors' attention. Among the bikes was a £25,000, 1,700CC and 103 cubic inch Harley Ultra. Road captain Mick Baines said: "The kids have absolutely loved it, and they've been getting on and having their pictures taken. "It meant a lot to Terry that we turned out, and it's nice to help support Tilly and her family. Plus, it shows people that bikers aren't all Hell's Angels." Emma Sawford said she would confirm the amount raised at the event next week. NEWS - Millennium Headlines Radio Station Charity Awards in Spain! Millennium was proud and honoured to headline the inaugural Bay Radio Charity Awards 2014! The exclusive gala event took place in the Costa Blanca, Spain on Saturday 12th April 2014, and was attended by the British Consul, the Major of Javea, and local dignatories, amongst others. It was a fantastic night that saw over 200 guests attend Denia's La Sella Marriott Hotel, as the efforts of 18 charities and charitable organisations, plus their volunteers received justifiable recognition. To see a video of the whole event click here (or the main image above), but watch until the end to see Millennium! Also to see a write up of firstly Millennium (page 22), and then of the Gala Charity Awards (page 43) in the online Euro Weekly News click the image to the right. NEWS - Millennium & The Greatest Take That Tribute!! It was 15th July 2010 when Robbie Williams officially announced he would be re-joining Take That, BUT unknown to him Millennium had beaten him to it!! Millennium's performances within the The Greatest Take That Tribute Band had taken place since 2009 and have since gone on to surpass all expectations with sell out performances, standing ovations and a show that is unquestionably the No.1 tribute to Take That in the UK! The Greatest Take That Tribute were formed in 2009 by assembling the very best lead vocalists and performers in the entertainment industry! So much so they were hand picked from existing Take That tributes and other leading tribute bands in the UK! The aim - quite simply to create the very best tribute to Take That! The result was achieved.............and then some! The Greatest are the only Take That tribute to feature the leading soundalikes to Gary Barlow and Mark Owen (see the audio clips on their website) in addition to incorporating the UK's No.1 Robbie Williams tribute artiste 'Millennium' into the group, to completely emulate 'Progress' and Robbie rejoining the group! With live five part harmonies and five lead vocals The Greatest Take That Tribute ooze talent in an 90 minute fully choreographed show (NB: 2 hour show available upon request). All the major hits are re-produced in the style of the original groups recent concerts, making you feel like you really could be at the 02! NEWS - Millennium mentors BBC presenter to win Children In Need 'Stars In Their Eyes'! Our very own Matthew Holbrook was pleased to help out for this worthy cause when the request came in to his agents for his expertise! The mission - to help BBC Radio Derby's afternoon show host, Ed George, transform himself into Robbie Williams for a special Children in Need challenge! The result - an emphatic win for Ed George in front of the nation and judges who included amongst others Robbie's long time friend Jonathan Wilkes! Matthew gave his assistance, pointers, fake tatoo's, and even his 'Let Me Entertain You' catsuit that was used for the BBC's 'The One & Only' trailors for Ed's performance when they rehearsed at the BBC Studios recently. The aim was to help Ed emulate Robbies moves and mannerisms for the 'Stars In Their Eyes' style performance which was broadcast live on Friday 14th November'08, from The Westfield Centre, Derby. Ed beat fellow broadcasters, Des Coleman, weatherman for BBC East Midlands Today, Tony Wadsworth from BBC Radio Leicester and Frances Finn from BBC Radio Nottingham, with Children In Need raising over £20,000,000! To see the full article on the BBC website click here. To see the BBC Children In Need website or to make a donation click here. NEWS - What a night in Bahrain! 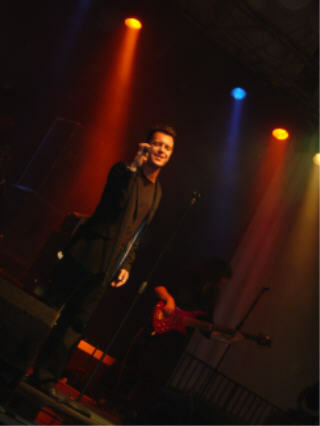 The month after the F1 Grand Prix hit Bahrain, Millennium flew in to entertain a packed venue during a manic month of May! The crowded bar was full of mixed nationalities, who didn't think they could get any better having seen the George Michael tribute Robert Lamberti in April. However the result was astounding as they realised they could, with the enthusiastic audience singing from start to finish. In fact they enjoyed themselves that much, when they brought Millennium on for an encore, the crowd invaded the stage to sing 'Could It Be Magic' with him! The venues manager said it all in his email to Millenniums agents Dansatak after the gig: "I wanted to thank you for the brilliant night we had with Millennium, the guy was awesome! Hope we keep on getting the best from you." The event was publicised in the countries leading arts & culture magazines 'Ohlala' and 'FACT' (shown above), and it turned out to be the busiest night they'd had since they began putting on tribute shows. Matthew said: "Thanks to the manager and all the staff for their hospitality and kindness, they put me up in a lovely hotel just a stones throw from the venue. It was such a long way to travel, but definitely well worth the trip!" NEWS - Come fly with me! Old Blue Eyes sang it, but it's our Rob's No.1 tribute who's clocking up the airmiles this year. With shows in Switzerland already performed in January, Millennium is set to continue his travels when he flies out to Bahrain then Ireland in May for one night shows, following on from which he will take his band out to headline at one the largest tribute festivals held in Italy during July! This is of course in addition to his recent return from an outside Festival in The Sultanate of Oman which took place at the end of March. The show took place on the 27th at The Marah Land Theme Park in Qurum near Muscat, which was the venue for The Zubair Corporations private event to celebrate the companies 40th Anniversary. Open only to employees and their families the 5000 strong audience were treated to an array of entertainment throughout the day that included clowns, face painters, donkey rides, camel rides, baloon artistes, water rides and fairground attractions with live entertainment from Indian Dancers, a magician, a Shakira Tribute and Millennium! The event was also covered by The Times of Oman Newspaper. Matthew said 'I had a great time and what an experience, the heat while I was performing though was intense 104°F / 40°C and 25% humidity! The people were lovely, the audience thoroughly enjoy themselves and the promoters really looked after me - when am I coming back!' Well it could be pretty soon judging by the impact he made! NEWS - Guess who's on the BBC One Trailers? BBC Ones new Saturday Night show The One And Only commences on 5th January08, and guess who's featured on the prime time trailers for the show, which were aired between 250-300 times between Christmas and the New Year? Yep - Millennium! If you saw the face painted Robbie in his Let Me Entertain You outfit, then now you know it was non other than Millennium aka Matthew Holbrook, who along with an Elton John lookalike goes about trying to sabotage a fake Kylies performance  all tongue in cheek of course! To watch the clip, click on the image in the You Tube link below. NEWS - It's a big thumbs up in Malta! 4000 People weren't wrong when Millenniums show in Malta was described as 'one of the best shows seen on the island'. With comparisons made to Sting's concert the month prior our boy Matt definitely 'dun good' in the hour and a half outdoor performance that wowed the mixed nationality audience. The event took place in Bahar ic Caghaq, and was Millennium's first time in Malta. Sporting Robbies latest image Matt appeared with his 4 piece band and 2 dancers and as seems to be the case with all his bookings, it looks like he'll be going back again next year! For more live shots take a look at the Gallery page. 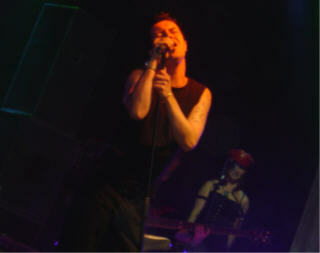 If you were in Wakefield on Friday 18th August then you may have heard Millennium performing! Rugby's Wakefield Wildcats took on fierce rivals Leeds Rhinos in a Tetleys Super League local derby clash. And guess who was there to entertain the fans as the pre-match entertainment - you've guessed it! Millennium performed a high energy 15 minute show at the Bell Vue Stadium - home of the Wildcats which took place at 7.30pm to bring both sets of fans up to vocal capacity before the match kicked off. This was then followed by a brief performance by Matthew in the VIP suite. By the way the match ended in a narrow 14 - 12 victory to the Rhinos. To see a full match report click here. Did you know? In 2004 Millennium performed to 65,537 fans as the chosen pre-match entertainment for the Tetleys Rugby Super League Grand Final, held at Old Trafford Stadium, Manchester. For the 2nd year in a row Millennium was booked back to The Masqueraders Carnival in Godney near Glastonbury. The event which took place on 22nd July was hosted by local radio celebrity 'Ian Burrage' from Orchard FM's Morning Crew, and saw Millennium perform to a rather packed and lively audience - to say the least! The show also featured tributes to McFly, Madonna, and Madness, but with this kind of response we won't be suprised if Millennium is asked back to make it 3 years in a row - watch this space! With a cram packed summer still underway it seems that Millennium's forthcoming headline appearance in Malta is becoming greatly anticipated on the island. 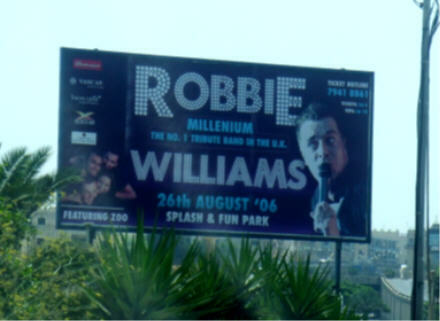 The show which will take place on 26th August'06 as an open air concert at the Splash & Fun Park Complex, in Bahar ic Caghaq, is being heavily advertised in newspapers, leaflets and on billboards (shown above) throughout the whole of Malta. Matthew Holbrook said jokingly "I can't believe it, I thought my agents had booked me in for a nice little gig out of the country! Even the promoters have got me lined up for interviews with the local media the moment I land at the airport. Saying that though I can't wait......Come On!" Millennium will be appearing with his 4 piece live band and two backing dancers, and will be supported on the bill by the boy/girl band Zoo. Sponsored amongst others by Budweiser, and with an expected audience of 4,000 it seems that the local Robbie fans and holiday makers are in for one hell of a night! NEWS - 'OFI Sunday' Performance Cancelled! Unfortunately Millennium's performance on the ITV show - OFI Sunday - will not be taking place! Millennium was booked to appear on the Chris Evans hosted show on Sunday 4th December'05, after being hand picked by Chris himself. 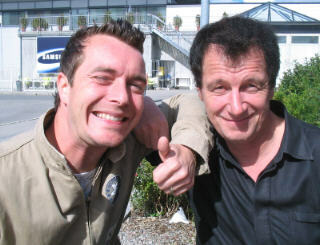 Restrictions on the length of the programme have meant that the production company UMTV have had no alternative than to cut the feature that was to see Matthew Holbrook perform as Robbie! A disappionted Matthew said 'I was really looking forward to the show. It's just such a shame it's not taking place'. UMTV have however said that they definitely want to use Millennium in the future, so watch this space! NEWS - Back to Norway! After numerous concerts in previous years Millennium was yet again flown out to Norway, this time to headline at the Otta Park Festival on 26th August'05! The promoters of the concert - Impact Events - who have been booking Millennium since 1999 were over the moon with his performance and the audience's responce! Barry Haig, Managing Director of Impact said after the Festival: "I just wanted you to know that Matt, as always, did a fantastic show here. He's a true professional, gives 150% on stage, and he's so easy to work with. It was a real pleasure working with him again!" NEWS - Millennium Headlines at Hastings Festival! 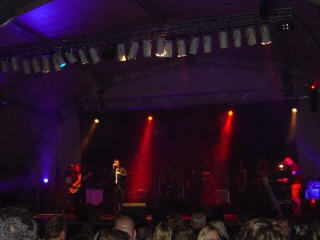 Millennium headlined at The Hastings Beer Festival on Friday 1st July'05 with his 9 piece live band! NEWS - In The Independent Newspaper! The event last October is still being picked up by the press! The latest article being an item on tribute bands by in The Independent Newspaper, written by Chris Mugan and published 8th April'05. What about a photo next time Chris? To see the full article on line click here. NEWS - Millennium performs to 65,500! On Saturday 16th October 2004 MILLENNIUM performed live to over 65,500 people at Old Trafford, Manchester! He was the chosen pre match entertainment for the Tetleys Rugby Super League Grand Final! The final - which was totally sold out to the venues capacity of 65,537 - saw Leeds Rhino's take on Bradford Bulls. "This is possibly one of the largest live audiences any tribute artiste, let alone a Robbie Williams tribute artiste has performed in front of, and is a testiment to the quality and demand of the Millennium show!" "We had to fly Millennium in specially on the morning of the Final, as he was performing in Norway the evening before and wasn't scheduled to return until late Saturday."